Thrift Thick: L'Oreal Voluminous Carbon Black Waterproof Mascara: Swatches + Review!! L'Oreal Voluminous Carbon Black Waterproof Mascara: Swatches + Review!! If you've watched my most recent "Empties" video, you'd know that my last mascara ran out (only lasted a month; what a b00b) and thus had me hunting for a new one. I should take that back: I hunted for nothing, I merely remembered I needed a replacement mascara pronto while buying deodorant and toothpaste at Target one day. And, very unlike myself, I decided to nab a completely random mascara; no previous research, no recommendation, just pure unadulterated grab-and-go. I wish I could say my spontaneity paid off. The package looked promising (as most do) and I must say I was extremely pleased with the way this mascara looked on my lashes. 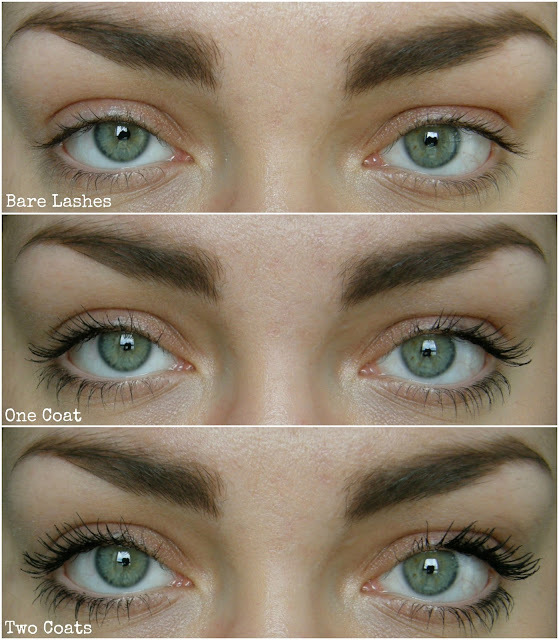 Two coats gave me length and weightless volume, all of which are things that I look for (and count on) in a mascara. So why did I give this post all sorts of negative connotations at the end of my intro paragraphs above? THIS MASCARA IS A SMUDGE-Y MESS. No one had to punch my eyes to create the black disaster above; that was all thanks to a day's wear of the L'Oreal Voluminous Carbon Black Mascara. Heck, this mascara is smudging the minute you put it on. It is so wet that it's nearly impossible not to get a teensy bit on your lid(s) during application and then if you make one false blink/twitch during the dry down you're effed (and should probably just go back to bed). I really want to love this mascara, truly I do because it is everything in terms of how it makes my lashes look and feel. Unfortunately the wear-factor, which for a waterproof mascara is absolutely pitiful, looks the positives straight in the face and smack-cam's them into submission; smack, laugh, uploaded to YouTube #forevershamed #foreveralone. Have you tried the L'Oreal Voluminous Carbon Black Mascara? What's your most memorable mascara meltdown (the photo above was after a day at work... attractive!)? Oh no! That is just not a waterproof mascara! I happen to like the L'Oreal Voluminous MILLIONS mascara quite a lot, but have never tried plain old Voluminous for comparison. But smudgey mascara, that's just not acceptable. Bad L'Oreal! Isn't it terrible!??!?! While I like the look of this mascara better than the Voluminous Millions, that one FAR out-performed this one. It is a true disgrace. Hahah bad L'Oreal indeed!!! Hehe, it sounds like Amelia is disciplining a dog! BAD L'OREAL! NOT UNDER THE EYES. NO SMUDGY. *composes* My biggest problem with waterproof is that it NEVER comes off, but this ... is just ... how could you even claim that? Haha. It looked so nice in the pictures though D: I'm happy to say I've never had a mascara meltdown, except the times when I almost ripped my lashes out trying to remove waterproof mascara. OUCH! Hahah that made me laugh too XD And yeah, this mascara just makes a mockery of the title "waterproof". UNACCEPTABLE!!! Such a shame because yeah I absolutely love the way it makes my lashes look T__T Ouch, no ripping out your lashes Jess!! Them's precious cargo on yo face! Lol I know, right???? The irony is strong in this one. I can't believe the original non-waterproof version performs better!! You're not the only one to say that either so it must be true. So weird!! This mascara looks lovely... it's a shame about the smudging!! I hate that! Wow that's quite a bit of smudging! I use the original voluminous (not carbon) and LOVE it. I don't have oily skin but I don't find it smudges at all. Perhaps you'd like to give that a try? It's super inexpensive too! I use the regular waterproof (waterproof is the only way to keep my lashes curled!) and have no smudging problems. I did have one tube of the carbon black and had the same problems as you- definitely try the regular waterproof formula though! It's the only mascara I use :) PS- new to your blog and love your kitty friend! !